Tick Talk » How long does it take to set down your tweezers? How long does it take to set down your tweezers? How long does it take to set down your tweezers and pick up a piece of peg wood or an acrylic stick to remove the spring clip? Just do it! It is an injustice and disservice to your customer to damage the bridge in this manner. Yes, your customer will never see it, unless I photograph it and put it up on my blog, but it is the responsible and professional way to do this. Please, take the time to do this the right way! This entry was written by Jordan Ficklin and posted on February 28, 2012 at 9:02 am and filed under watchmaking. Bookmark the permalink. Follow any comments here with the RSS feed for this post. Post a comment or leave a trackback: Trackback URL. Another subject completely, where can i obtain the acrylic sticks i.e. like the rolex ones other than making them? Bergeon makes acrylic sticks if you want to pay a fortune for them. I just order acrylic rod from MSC and cut them up. The minimum order will give you a lifetime supply. eBay is a good source for small quantities of acrylic. I see this problem ALL THE TIME. In fact, I just finished up one of “those calibers” last night and noticed this type of damage. You know, I would gladly changed the bridge if I knew the damage would not happen again. The problem is that so many watchmakers still use #2 steel tweezers on brass components, because they are less expensive than brass tweezers. Bergeon AM Brass tweezers cost about $25 and would help at least minimize this issue. Is it really worth leaving graffiti on a $50-$200 bridge because the watchmaker was too cheap to get a good pair of tweezers or a plastic stick? 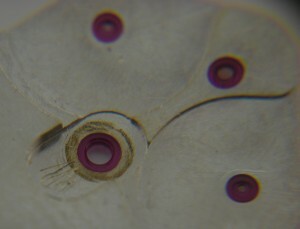 I agree with you, J.Peter, the customer should take their timepiece to a professional, because this type of damage will be left all over the movement, not just in the places where the customer can’t see. @Jonathan Nachman If you are really lucky, those acrylic sticks might be available at a local full supply hobby store, in longer lengths and at lower prices than what Bergeon sells them for. Thanks for the above advice, I was unaware that burgeon did these…… Anything in a yellow box seems to have a somewhat ridiculous price tag. I, also, have to agree here. If I’ve said it once, I’ve said it a thousand times. “Use the right tool for the right job!” If you don’t have the tools, don’t do the job, until you do. Reminds me of a Breitling chronograph with an old Lemania movement inside. I take the back off and ever single visible screw head was damaged. I closed it up and gave it back to the boss and told him to give it back to his friend. I so did not want to go digging any further into that horror show. @Jonathan A plexi-stick is a well worth picking up. After my tweezers and screwdrivers, it is one of my most used tools. For the example above, I prefer to use pegwood to remove the spring, but the plexiglass stick still has many uses beyond that. @Mike B. Bronze tweezers are also excellent. I find that they hold up better over time than brass. Well I can understand the frustration at someone scratching the bridge, but why does it need to be replaced? Does it not function anymore? There is potential for malfunction here because the clip needs to be free to move. The roughness in this location could cause a problem, but in this case I was referring to the mainplate which I had to replace because somebody fit a jewel into the mainplate that was so loose it was falling out. This is a disappointing sight. I’m curious whether some “professionals” would be guilty of these kind of actions too…? Not to flame, but I’ve seen some questionable work come out of RSC NY and this wouldn’t be out of the scope of possibility…. How often do you see this type of thing? This was pretty extreme but I see scratches in this area on probably 30% of this caliber, keeping in mind that they are 50 year old watches and a lot of watchmakers have worked on them over the years. Reading these and other posts just scares the heck out of me. The thought of having someone “service” my watch at routine intervals is no difference to me than having my engine torn down and reassembled “just because”. As a former mechanic, then prototype build technician, then engineer and service manager for a Fortune 100 company, I get ill (literally) when I have to take my car in for a repair – and when my watch needs its first service I will think long and hard before sending it to someone for which I have no way to evaluate his/her technical skills, attitude, and/or work ethic. Both of the repairs that I’ve experienced with other watches turned out to be two-step processes (first they were repaired, then they were fixed) – and both were refered by trusted dealers. If i can add some advice, try to stay away from acrylic sticks when pushing on any bridges or anything thats been decorated, it might not feel like it, but the acrylic surface is actually pretty hard and will scratch your rhodiated or gold plated bridges. Personally, i just work with wooden sticks that i cut after the need at hand. Ofc, press hard enough and even the softest wood will leave marks on the bridges, but your margin of error is bigger than with acrylic. This depends on what kind of acrylic you use. The black ones CEO. Bergeron are rwly hard. I use clear cad acrylic sticks which are much softer.